Wedding cakes ordered from Albertsons may not offer the same frills as designer cakes that sell for hundreds or even thousands of dollars. However, their wedding cakes are surprisingly elegant. Couples can save money on their wedding dessert without sacrificing quality. A cake from Albertsons has a few advantages over potential competitors. The first is its price-although Albertsons cakes don't look cheap, they are some of the most affordable on the market and can be a great help to brides and grooms who don't have much money to spare. For couples who want a traditional, simple cake, Albertsons can provide a wide variety of wedding cake design samples from which to choose. Finally, Albertsons wedding cakes are known for their great taste and freshness. Although Albertsons staff members are happy to consider unconventional designs, the store shines when it comes to traditional wedding cakes. Tiered, round cakes with white buttercream frosting and flowers make up a large percentage of the wedding cakes that the store produces, so couples that want those things are likely to be very satisfied with an Albertsons order. For cakes with any type of customized detail or design, be sure to contact the store well in advance and discuss what you want in depth to make sure that they'll be able to accommodate your requests. Usually, decorators will have no problem with adding a fountain or fresh flowers to the cake in time for the reception or decorating it with a personalized topper that you received through another outlet. To guarantee that they have enough time to prepare a cake to your liking, Albertsons requests that you contact them at least a month in advance and bring in any color or design samples that you need to match with the cake. If a wedding cake is one of the most important parts of the reception for you, it might be worthwhile to splurge on a cake that's customized to fit a special theme or meet all of the parameters you'd like. If you'd be satisfied with something basic, traditional, and classic, however, think about the importance of the following factors before you choose an Albertsons cake. How many guests will be at your wedding? Large ceremonies and receptions call for huge cakes, and guests may expect elaborate desserts. In a small, intimate ceremony, it might be more socially acceptable to serve a cake that's simple. What is your budget? Cost factors heavily into the type of cake that most engaged couples end up choosing. Albertsons wedding cakes tend to be cheaper than those from local bakeries and even some other grocery stores, so if you're working with a very limited budget, talk with an Albertson's baker to learn more about the store's price range. What type of design do you want? Although Albertsons bakers and decorators are happy to work with brides and grooms on design development, it's helpful to come with a design or template in mind and to provide specific directions about what you want the finished cake to look like. To be sure that you'll get the level of quality you expect from Albertsons, read through a collection of reviews at WeddingWire, or other similar sites, from other couples that have ordered wedding cakes from the store. 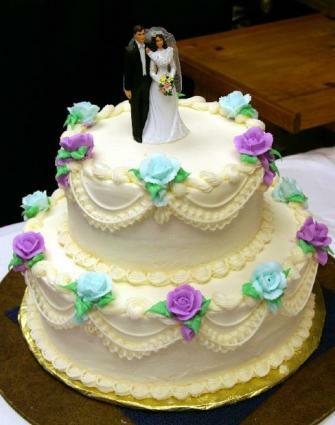 Overwhelmingly, reviewers on the web seem to be satisfied with their Albertsons wedding cakes, although some did note problems varying from frosting colors that were too bold to cakes that looked different from their original plans. Visit several cake shops, including Albertsons, and compare what they offer. It's your wedding day, and you deserve to have a cake you can enjoy at your reception and remember fondly in years to come.